Rocky Mountain Clean Air Action needs your support. Rocky Mountain Clean Air Action is a leading advocacy group working to protect clean air for healthy children and healthy communities in Colorado and the surrounding region. However, as a nonprofit organization, we rely solely on donations from our members to sustain our work. If you haven't joined, become a member today and consider giving a modest donation. Your support will help us continue to tackle smog pollution in the Denver metro area, hold the oil and gas industry accountable to clean air, and clean up smokestacks at cement plants and coal burning power plants. Most importantly, your support will make a difference for the health of our children and our communities. What a deal! The coal resurgence in the west is old news for the most part, what with all the talk today about renewable energy, climate change, mercury pollution, smog, premature death, and so on and so on. But a new report from the Department of Energy shows that the coal resurgence is, sadly, still alive and well here in the Rocky Mountains. According to the Department of Energy, 31 new coal burning power plants are proposed for construction or are in the process of being built in Arizona, Colorado, Montana, New Mexico, Utah, and Wyoming. Wyoming alone has 11 plants proposed, with Colorado not far behind at 6. A proposal by the Department of Energy itself to build a 150 megawatt coal burning power plant in Colorado Springs, which may be on hold now. Tri-State's proposal is the most shocking of the bunch. A 1,000 megawatt coal burning power plant is massive, providing enough power for around a million homes. Also, remember that Tri-State Generation and Transmission has been talking about investing in more renewables, energy conservation, and demand side management. Is this just lip service? With growing recognition that burning more coal will only fuel continued environmental destruction and the decline of our health, the Department of Energy report is a grim reminder that we're still not on the right track. We may be making progress in some ways, but six new coal burning power plants is six too many in our mind. Rocky Mountain Clean Air Action and a coalition of citizens groups today petitioned the U.S. Environmental Protection Agency to require the state of Colorado to start regulating air pollution from oil and gas drill rigs. Drill rig engines can spew upwards of 79,000 tons of nitrogen oxides annually. Nitrogen oxides are linked to sudden infant death syndrome and a slew of negative health and environmental impacts. The amount of nitrogen oxides potentially released by drill rigs equals the amount released by over 4,000,000 cars each driven 12,500 miles annually. Despite the fact that record drilling permits have been issued in Colorado, drill rig engines are totally exempt from air quality regulations. Drill rig engines need no permits and aren't required to report the amount of pollution they spew out to the state. Today's petition calls upon the EPA to hold Colorado's regulations illegal and require the state to revise them. In response to comments from Rocky Mountain Clean Air Action and numerous citizens, the Colorado Air Pollution Control Division has agreed that a stronger air pollution permit is needed for Tri-State's coal burning power plant in Craig. Last January, the Division proposed to issue a permit to Tri-State so that it could burn more coal and increase its pollution at one of its boilers in Craig. The permit, unfortunately, failed to require the best pollution controls to keep particulate pollution in check. Particulates from Tri-State's smokestacks are so small that they reach the very bottoms of our lungs when breathed in. Tri-State's efforts to burn more coal are confusing, to say the least. The company has stated a commitment to integrating more renewable energy sources into its power generation and a commitment to energy efficiency and better demand-side management of consumption. Tri-State's move to burn more coal at its Craig power plant, especially given the health impacts of more coal smoke in the air, seems beyond comprehension. The Division agreed that stronger limits on particulate pollution were needed. The permit now limits particulate pollution to between 14 and 20% less than what was originally proposed. The Division agreed that stronger limits on opaciy, or the thickness of the coal smoke, were needed. The permit now limits opacity to no more than 10%, lower than the originally proposed 20%. This represents a 50% increase the protection afforded by the pollution permit. The pollution permit is by no means perfect, but it's a good step forward, and it couldn't have happened without the support and comments of citizens. The Denver Post should have done its homework here. It's true that there are rising concerns over the health impacts of air pollution from gas wells here in Colorado. A story in the by Nancy Lofholm two weeks ago certainly hit the nail on the head, quoting doctors and others who have experienced first hand how benzene and other chemicals spewed from these wells are creating a health nightmare. But it's not true, as Lofholm reported two weeks ago and the Post Editorial Board opines today, that gas wells are too small to be regulated by the U.S. Environmental Protection Agency. Under the federal Clean Air Act, gas wells are supposed to be aggregated with the compressor stations and processing plants that they feed. In other words, gas wells and the larger facilities they pipe gas to, are supposed to be regulated as a single source of air pollution, just like a power plant. Aggregation safeguards make sure that industry doesn't piecemeal its development to avoid using the best available pollution controls. Of course, when it comes to gas wells, industry has piecemealed its development. Now instead of regulating one source of air pollution, we're struggling to regulate thousands of individual gas wells. Making things worse, the U.S. Environmental Protection Agency has made it easier for the oil and gas industry to avoid aggregation safeguards. A lot of people want to think it's just a coincidence that gas wells are unregulated while people are being poisoned by air pollution. No, it's not. There's a clear reason: the oil and gas industry is not following the law. And with a clear reason, there's a clear solution: make the oil and gas industry follow the law. 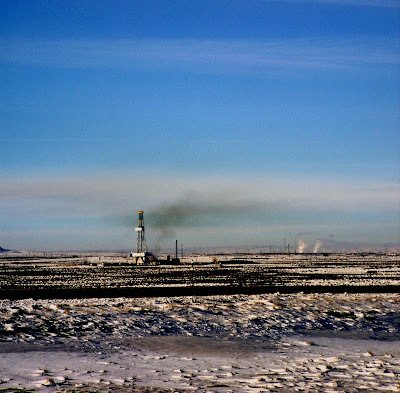 There is no need to take a "hard look," as the Denver Post suggests, at ways to regulate air pollution from gas wells. The Post needs to quit making this issue more complicated than it is and demand accountability from industry. In fact, Rocky Mountain Clean Air Action is laying the groundwork for just this kind of accountability. Right now, we're gearing up to file suit against the U.S. Environmental Protection Agency over its failure to require Kerr-McGee to follow aggregation safeguards north of Denver. Kerr-McGee operates over 3,600 natural gas wells north of Denver, which feed into 7 compressor stations. Let's not go out and buy a new set of tools when we have all the tools we need right now in our tool box to get the job done. Air pollution from gas wells can be reined in. It's as simple as following the law. Nitrogen deposition is the greatest threat to Rocky Mountain National Park and it's all because of air pollution. Fortunately, the state of Colorado, National Park Service, and the Environmental Protection Agency are forging a plan to cut nitrogen pollution. This means cutting nitrogen oxide emissions from smokestacks and tailpipes, and ammonia emissions from feedlots and farms. But what will the plan look like? So far, the draft plan is pretty toothless. Although scientists have found that nitrogen deposition is increasing by 2% annually, the plan calls for no actual pollution reductions. Instead, it relies on existing regulations and voluntary pollution reductions from agriculture. We may be missing something, but this just doesn't add up. With increasing nitrogen deposition projected into the future, the status quo doesn't seem to offer much in terms of relief. The Colorado Air Quality Control Commission is set to adopt a plan at their June meeting in Estes Park. Hopefully the Commission will call for some sort of mandatory pollution reductions; after all, this is Colorado's #1 tourist destination on the line. In the meantime, Rocky Mountain Clean Air Action is working to cut nitrogen oxide emissions from the Cemex cement plant just outside Rocky Mountain National Park. This effort could lead to a 90% reduction in nitrogen oxides, a solid first step toward reversing nitrogen deposition trends. This diagram makes nitrogen deposition appear more complex than it is. Nitrogen deposition is basically overfertilization of soils and waters. Too much fertilizer kills, and that's exactly what is happening to Rocky Mountain National Park. With rising ozone trends in the Denver metro area, we may be on track to violate fedreal health standards and ensure some of the smoggest and most unhealthy air in recent times. So far in 2007, the highest ozone levels in recent times have been recorded. Check out the post at Denver Ozone. The Denver Post reports yesterday on how oil and gas developments are spewing out harmful air pollution, making nearby residents sick. The oil and gas industry of course "downplays" the connection. In other words, industry doesn't believe there's a link between peoples' illnesses and the benzene and other toxic gases that are released by their developments. The burden of proof, industry says, lies with the people being gassed. That's like asking an attempted murder victim to prove a gunshot wound could have been fatal. Of course, this would never happen. Similarly, nobody should ever have to prove that oil and gas developments are causing illnesses. It should be the industry's responsibility to prove that their toxic gases are not destroying peoples' lives by making people ill. It's a simple matter of erring on the side of health, whereas the oil and gas industry would rather err on the side of sickness and death. But the real horror in all of this is that air pollution coming from oil and gas developments is largely illegal. Under the Clean Air Act, oil and gas wells and related source of air pollution are to be considered a "single source." This means that wells and other sources of air pollution should be regulated as if they were a single, functional factory. It's just like a power plant with smokestacks. We don't just look at pollution from one smokestack, we look at all of them. And with oil and gas, we should be looking at every development together. If we did so, the oil and gas industry would rank as one of the largest sources of air pollution in Colorado and would be subject to the most stringent Clean Air Act requirements. With more and more falling ill because of oil and gas development, the oil and gas industry is going to have to face prospect of following the Clean Air Act. Rocky Mountain Clean Air Action will be sure of it. A key Colorado budget provision has survived a bout of constitutional squabbling, meaning western Colorado is on track to get the smog monitors it needs to protect communities from rising air pollution. It is the intent of the General Assembly that at least $380,000 of this appropriation be used for the collection and evaluation of air quality data on the Western Slope of Colorado. Earlier in the week, Governor Ritter vetoed this footnote. The Legislature on Friday then overturned Governor Ritter's veto, keeping footnote 108a in place. But in all fairness to Governor Ritter, he didn't veto this footnote because he disagreed with the need to install air monitors. The footnote was simply the latest victim of constitutional squabbling between the Governor and lawmakers. As the Governor stated, even in light of his veto, he still planned to direct the Colorado Department of Public Health and Environment to comply with footnote 108a. In any event, the important news is that the efforts of local governments, Rocky Mountain Clean Air Action, and our clean air partners have paid off. And of course, a big thanks goes out to Representative Bernie Buescher, whose leadership really made this happen. Western Colorado is now on track to get the air monitors it needs and deserves. Five new members of the Colorado Air Quality Control Commission, the body of government that makes clean air rules and keeps the Colorado Air Pollution Control Division on task, were unanimously confirmed today by the Senate Health and Human Services Committee, and Rocky Mountain Clean Air Action was there to lend support. Jim Wilson, Environmental Protection Manger at Roche Colorado, a pharmaceutical company that has come a long ways to clean up its air pollution and really keep our air healthy. The next step is full Senate confirmation, which should be a breeze. After that, these Commissioners go to work alongside four others: Cynthia Peterson, Robert Lowdermilk, Doug Lawson, and Garrett Clemons. So why is the Air Quality Control Commission such a big deal? Because in taking on air pollution problems, the Commission invariably takes on Colorado's most pressing environmental concerns. The Commission will take on everything from mercury pollution to greenhouse gas emissions in the coming years, as well as air pollution from rampant oil and gas drilling, which is leading to haze in wilderness areas and illnesses in local communities. The decisions of the Air Quality Control Commission will truly decide whether the future of Colorado is one of worsening smog and illness, or a future of clear, healthy skies. The five new Commissioners promise to breathe some hope into our future and, together with the existing Commissioners, hopefully will put us on track for the clean air we sorely need. The American Lung Association has released their "State of the Air: 2007 Report," and while Coloradoans are breathing easier than those in Los Angeles, we still have a ways to go before our air is truly healthy. We took at a look at how Denver's air quality ranks. For ozone pollution, or smog, Denver gets a C and for particulate pollution, we get a D. Those are passing grades, but they're enough to make any teacher cringe. In other parts of Colorado, Fort Collins and Loveland received a D for their ozone pollution. When it comes to clean air, Denver should have straight A's, as should all of Colorado. The American Lung Association's report shows that we still have our work cut out in terms of keeping our skies clean, healthy, and clear.